A large difference between high pressure to the east and low pressure to the west will lead to windy conditions across the Finger Lakes. 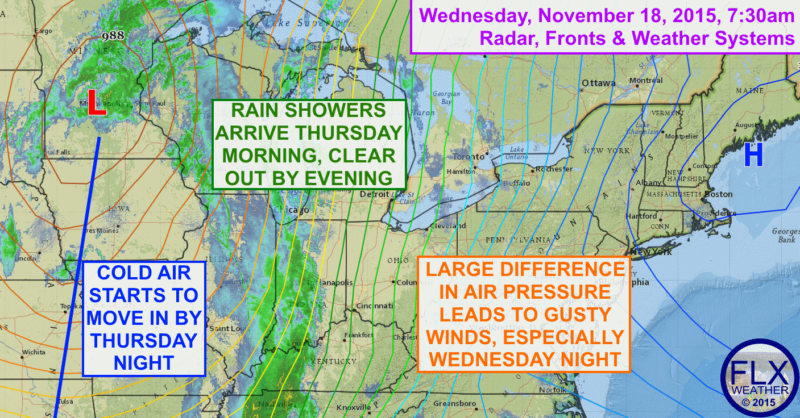 High pressure east of the Finger Lakes and low pressure to the west will battle for control of the Finger Lakes’ weather. Ultimately, the low pressure, and its associated cold front, will win out. But their eastward progress will be slow as the high tries to stand its ground. In between these two strong pressure systems, the tight gradient in air pressure will lead to windy conditions. South winds will strengthen throughout the day, peaking overnight and remaining gusty into Thursday. This is not a huge wind storm, but gusts of 35-45 mph are likely. With the gusty south wind, temperatures will reach the mid and upper 50s this afternoon and will drop very little overnight. Temperatures on Thursday are a bit tricky. Rain will be moving into the area early in the morning, but the cold front will lag behind. For areas in the western Finger Lakes, this could result in a period of sun between the rain in the morning and the cold front later in the day. This could boost temperatures into the 60s for a brief time, while the rest of the region makes it into the upper 50s. The cold front should start delivering colder air by Thursday evening. High temperatures Friday and Saturday will only manage the mid 40s, with lows in the 30s and possibly even 20s. It will be sunny and dry though, as an area of high pressure builds in, cutting off any lake effect before it has a chance to develop. A storm system will develop over the region on Sunday. This system looks more favorable for significant wind and could also produce some lake effect as it reinforces the cold air. Temperatures on Monday may not escape the 30s.